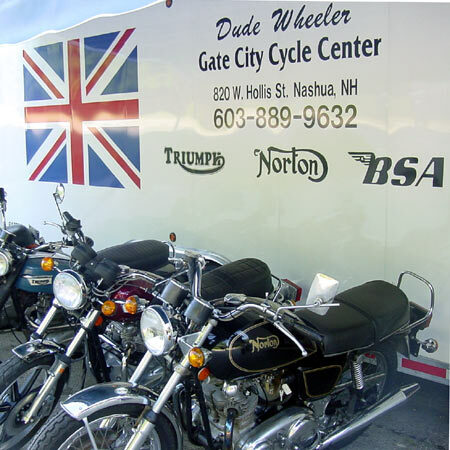 If you are looking for a preowned Triumph, Norton or BSA motorcycle or just a part, give us a call or visit our retail location in Nashua, NH. We have an ever changing inventory of vintage preowned British motorcycles for sale. Gate City Cycle Center, founded in 1959 has been an authorized Triumph Motorcycle dealer since 1964. The current owner Jerry "Dude" Wheeler purchased his first motorcycle from Gate City Cycle Center in 1965 after he left the U.S. Marine Corp. The Wheelers' family business is motorcycles. Dude's brother Rick is the owner of Hudson Cycle, and his brother Joe owns M.O.M.'s. In addition, M.O.M. 's South is owned by Joel, Dude's nephew. We're located in Nashua, NH at 820 W. Hollist St. You can call us at 603-889-9632. Our current motorcycle inventory will be listed here shortly!